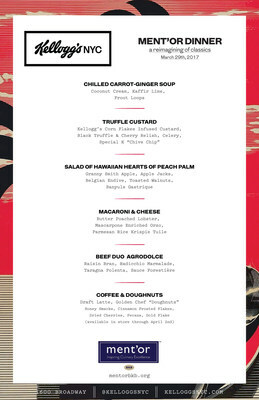 BATTLE CREEK, Mich., March 30, 2017 /PRNewswire/ -- Kellogg's® is putting a twist on the signature dishes of world-renowned chefs Thomas Keller and Daniel Boulud. 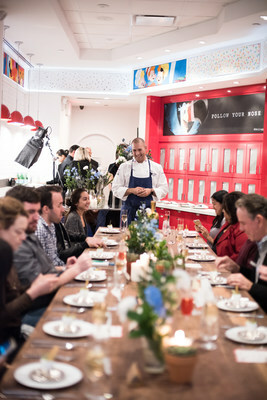 For one night only, select guests experienced an exclusive six-course tasting menu of recipes recreated with cereal at Kellogg's NYC. 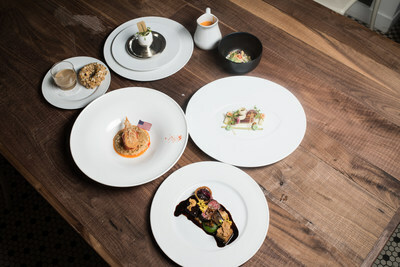 To entice diners and tempt their taste buds, Kellogg's NYC brought together a team of professional chefs, some of whom recently worked together to win Bocuse d'Or, the most prestigious culinary competition in the world. 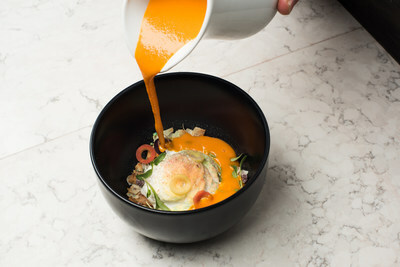 Chefs Mathew Peters and Travis Swikard were tasked with using Kellogg's cereal to recreate famous dishes by chefs Thomas Keller and Daniel Boulud. In addition, chef Harrison Turone from Team USA was on-site to join in this culinary experience. Together, these chefs were not only the first team of Americans to win Bocuse d'Or, but they're also bonded by mutual support for ment'or, a nonprofit that inspires excellence in young culinary professionals. "I'm excited to see my fellow ment'or chefs re-create my well-known dishes using a favorite breakfast staple, cereal. You don't have to be an award-winning chef to get creative in the kitchen and think about food in unique ways," said Chef Daniel Boulud. 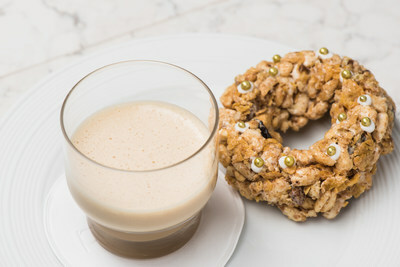 "We're celebrating the techniques and creativity of some of the world's greatest chefs," said Anthony Rudolf, co-owner of Kellogg's NYC, founder of Journee and former director of operations at Thomas Keller Restaurant Group "We'll give guests a chance to experience cereal in a completely new way." 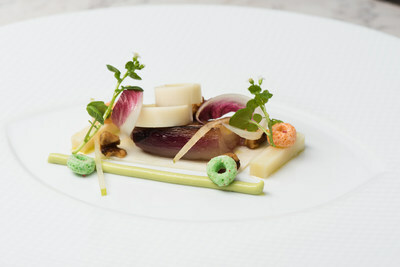 Kellogg's Corn Flakes® Infused Custard, Black Truffle and Cherry Relish, Celery, Kellogg's Special K® "Chive Chip"
From Thursday, March 30th, through Sunday, April 2nd, the golden chef doughnuts along with cereal bowls designed by Chefs Thomas Keller, Daniel Boulud, Gavin Kaysen, Harrison Turone, Mathew Peters, and Philip Tessier will be available at the café for $8. Proceeds from the bowls will benefit ment'or and will come with a numbered ticket. Two tickets will be chosen on Monday, April 3rd, and one winner will receive dinner for two at Restaurant Daniel and the second winner will receive dinner for two at Per Se in addition to a Kellogg's NYC gift bag. Whether you're at home recreating your own bowl or at the café indulging in a chef-designed cereal bowl, Kellogg's hopes to inspire all to reimagine the endless possibilities of cereal. For more information about Kellogg's NYC check out KelloggsNYC.com or follow us @KelloggsNYC and #KelloggsNYC. At Kellogg Company (NYSE: K), we strive to make foods people love. This includes our beloved brands Kellogg's®, Keebler®, Special K®, Pringles®, Kellogg's Frosted Flakes®, Pop-Tarts®, Kellogg's Corn Flakes®, Rice Krispies®, Cheez-It®, Eggo®, Mini-Wheats® and more – that nourish families so they can flourish and thrive. With 2015 sales of $13.5 billion and more than 1,600 foods, Kellogg is the world's leading cereal company; second largest producer of cookies, crackers and savory snacks; and a leading North American frozen foods company. Through our Breakfasts for Better DaysTM global hunger initiative, we've provided more than 1.4 billion servings of cereal and snacks to children and families in need around the world. To learn more, visit www.kelloggcompany.com or follow us on Twitter @KelloggCompany, YouTube and on Social K.
Ment'or is a leading nonprofit organization devoted to inspiring culinary excellence in young professionals and preserving the traditions and quality of cuisine in America. Ment'or's aim is to build a sustainable community of young American professionals that are knowledgeable and confident in their career pursuits and will be life-long ambassadors of quality and excellence in the world of gastronomy. The organization is dedicated to making the careers of serious young individuals more meaningful and successful by offering them unique educational opportunities, internships and access to a Culinary Council of established mentors. Anthony Rudolf has nearly 20 years of experience in the restaurant industry, including running operations for Chef Thomas Keller and Chef Jean-Georges Vongerichten in New York. After realizing his true mission was not to serve consumers, but to nurture and guide people in the industry along their path of living their dreams, Rudolf left the Thomas Keller Restaurant Group to found Journee, a community that empowers and educates restaurant professionals. In addition to being the founder and CEO of Journee, Rudolf is the co-founder of The Welcome Conference: a first-of-its-kind hospitality conference that brings together leaders to inspire, share, and connect. He is currently an ambassador of The Culinary Institute of America and has spoken on the topic of hospitality at numerous professional institutions, including a speech on Chivalry at TEDxEast in 2011. Sandra Di Capua has had a lifelong passion for food and hospitality and has been working in the industry for the past ten years. She began her career as research and culinary assistant to renowned cookbook author, Joan Nathan, working on her book on the food of the Jews of France. She then moved to New York to join the dining room team at Eleven Madison Park. There, she began as a coat check and worked her way up through the ranks, eventually becoming the project manager. She worked on the purchase of Eleven Madison Park from Danny Meyer's Union Square Hospitality Group, assisted in developing and opening the food and beverage programs at the NoMad Hotel, and helped write, edit, and publish Eleven Madison Park: The Cookbook and I Love NY: Ingredients and Recipes. Currently she is the co-owner of Kellogg's NYC and co-founder of Co.create NYC, a collaborative marketing, PR, and development firm bringing authentic hospitality to experiential retail. A graduate of Harvard College, she was born in Bogota, Colombia, grew up in Miami, FL, and currently resides in Manhattan. Renowned for his culinary skills and his impeccable standards, Thomas Keller is the chef and proprietor of The French Laundry, a Yountville, California landmark that has been hailed as the finest restaurant in the world. Ten years after opening this, his first restaurant, in 1994, he followed with Per Se, which brought his distinctive fine dining style to Manhattan. Today, both restaurants enjoy three-star Michelin ratings, making Keller the first and only American-born chef to hold multiple three-star ratings from the prestigious dining guide. Chef Keller has also opened Bouchon, Bar Bouchon, Bouchon Bakery, and Ad Hoc, each of which contributes to the new paradigm he has set within the hospitality industry. More than one million copies of Chef Keller's books, including the New York Times bestsellers "Ad Hoc at Home" and "Bouchon Bakery," and "The French Laundry," "Bouchon," and "Under Pressure," a book devoted to sous vide cooking, are in print. Keller was designated a Chevalier of The French Legion of Honor in 2011, the highest decoration in France, in recognition of his lifelong commitment to the traditions of French cuisine and his role in elevating cooking in America. He is only the third American culinary figure to be so honored. Daniel Boulud, a native of Lyon, France, is today considered one of America's leading culinary authorities and one of the most revered French chefs in New York, the city he has called home since 1982. He is probably best known for the exquisitely refined DANIEL, the three Michelin-star Relais & Châteaux restaurant. Over the last two decades, Boulud has evolved from a chef to a chef-restaurateur, bringing his artistry to NYC restaurants Café Boulud, Bar Boulud, Boulud Sud, db Bistro Moderne, DBGB Kitchen and Bar and Épicerie Boulud. Outside of New York, the chef's seasonal French-American cooking is found in Florida, Las Vegas, London, Singapore, Montréal and Toronto. Daniel Boulud is the author of eight cookbooks, the recipient of multiple James Beard Foundation awards including "Outstanding Restaurateur," "Best Chef of New York City" and "Outstanding Chef of the Year". In 2006 Boulud was named a Chevalier de la Legion d'Honneur by the French government for his contribution to the advancement of French culinary culture. Chef Peters grew up in Meadville, Pennsylvania and began cooking as a teenager with his family. As a senior in high school, he was inspired to cook professionally after he was captivated by the Great Chefs of the World TV show. At 19, Chef Peters enrolled in culinary school at Le Cordon Bleu in Pittsburgh. Upon graduation, he moved to Naples, Florida where he worked for the Ritz Carlton in the infamous Dining Room among many other notable chefs. After years of honing his skills in Naples, he set his sights on New York City and took his first job in the city at Adour Alain Ducasse. He continued to work there until he was offered a position at Per Se in 2009. Chef Peters worked his way up from commis to chef de partie, and eventually up to sous chef. Shortly after he became a sous chef at Per Se, Chef Keller offered him the opportunity to work as a sous chef at his flagship restaurant, The French Laundry. He spent over 2 years at The French Laundry, and was promoted back to Per Se as the Executive Sous Chef in February 2012. As Executive Sous Chef, Chef Peters oversees and manages the staff, runs service, and creates a new menu each day. His intense focus and attention to detail allows him to flourish in such a notable 3 Michelin star kitchen, inspiring younger cooks to do just the same. Harrison Turone began his culinary career in high school, where he was in a dual enrollment program earning college credits while still in high school. He soon realized that cooking was his passion and started staging at some of the best restaurants in his hometown. After high school, Commis Turone enrolled in culinary school while also working full time as an entremeitter at V. Mertz restaurant. He ultimately realized that it would be more beneficial for him to fully submerge himself into the kitchen. He left V.Mertz and staged at various restaurants in San Fransisco, until he eventually took a job at Ad Lib, The French Laundry's temporary pop up restaurant in Napa.